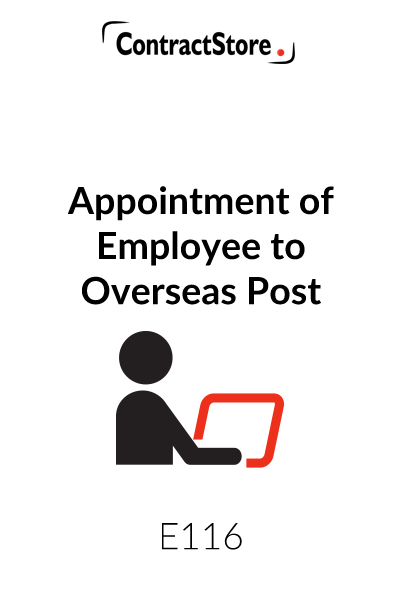 Who can use this Appointment of Employee to an Overseas Post? Any employer engaging someone to work in another country. What is this appointment for? It is suitable both for engaging a new recruit and for an existing employee who is to be posted overseas. What are the main issues for appointing an employee to an overseas post? An employer needs to consider the visa requirements as well as the tax implications and the employment laws in the country to which the employee will be sent. Usually the the employer will rip will already have an office tower, but that is not always the case. Also the type of person who is likely to thrive in what at first may seem a somewhat alien environment. 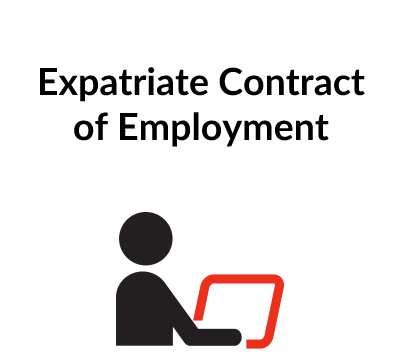 In addition, you need to consider what sort of ‘expatriate package’ is appropriate in that country and for the level of seniority of the employee. Will you be providing housing or a housing allowance, airfares for the individual and/or family on annual leave etc.? What detailed terms does this employee appointment contain? For more details, see the Explanatory Notes below. 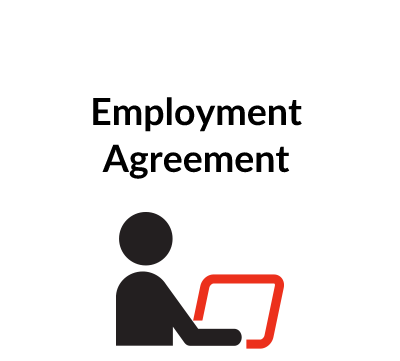 An agreement can be in the form of a letter which, in this case, is addressed to the employee and signed by the employer. When the letter is accepted and signed by the employee, it is an effective binding agreement just as a more formal agreement between Party A and Party B would be. A letter agreement is more user-friendly than an agreement written in the third person, and especially useful if the parties know each other and want a simple but effective deal. Yes, all ContractStore’s templates are in editable MS Word. You can adapt it as appropriate and you can use it for more than one appointment. For more information, watch the video on this page of our website or see our FAQs. ContractStore supplies templates and is not a law firm. However our templates are all written by experienced lawyers, in this case by an English lawyer who is qualified to practice in India. So, we can arrange legal support if required. See our legal services page for more details. 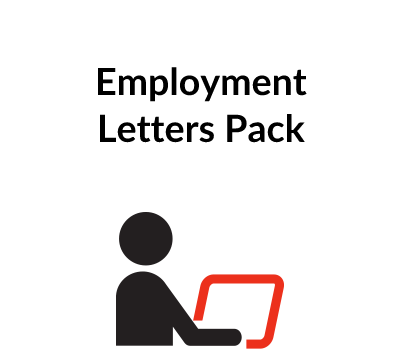 This employment contract, prepared in the form of a letter, is designed for use where a company engages someone to work for it in an overseas office. In such circumstances, the labour law in the country where the employee will be based needs to be considered, as well as the tax implications for the employee. These are not matters which are covered by our document and specialist advice will be required. A contract on the terms set out in the letter is made when it has been signed by the employer and countersigned by the employee without any qualification. This sets out the job title, the person to whom the employee will report and normal working hours. The letter nonetheless makes it clear that work outside those hours may be required. This sets out the initial contract period and start date and well as providing for a notice period. Note that where the employee conducted himself in a manner that entitles the employer to dismiss him, a further provision may be added that no return fare will be provided, although in certain countries there may be an obligation on the employer to secure the removal of the employee from the country. Specialist advice should be taken on such matters. As drafted, this contemplates that salary might be paid wholly or partly in local currency and the exchange rate is fixed on an annual basis. Clearly, the precise wording will depend upon the particular circumstances. We have not dealt with income tax in this Agreement. This can be a fairly complex subject, especially if the Territory where the employee is based imposes income tax at a higher level than the home territory. Both employer and employee need to deal with these issues and appropriate wording needs to be incorporated in the letter of appointment. These vary from company to company and from job to job. Here we assume an air ticket will be provided for the Employee and his/her family accompanying him/her plus an excess baggage allowance. Here again, the situation varies from Employer to Employer and from country to country. Usually, if an Employee is posted to a developing country he/she is provided with furnished accommodation or an accommodation allowance. From the Employee’s point of view, it is important to do some research – to see that accommodation is of an adequate standard or, if an allowance is given, that it is adequate to secure suitable housing. The provision of a car by an employer is a fairly standard perk in many countries nowadays. 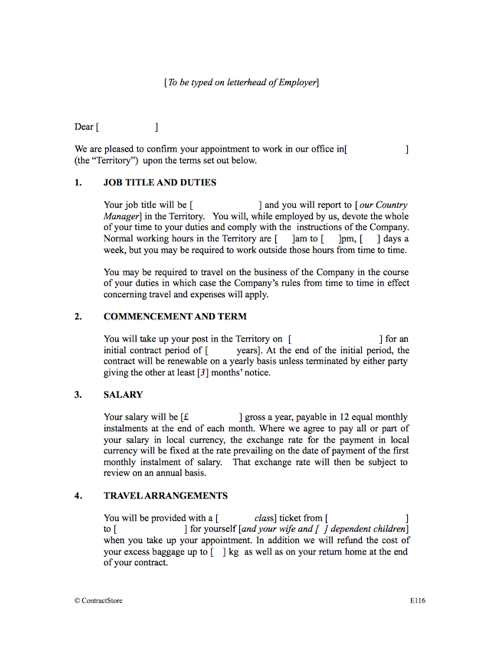 The letter assumes the employee will be given one return ticket for himself and his family each year to his home country. Sometimes there is a restriction on the amount of leave which can be taken at any one time and a distinction is made between home leave and local leave. Especially where the employee is a senior manager, a contribution towards children’s education is sometimes a feature of an expatriate employment package. A company with an establishment overseas is likely to have an effective medical insurance scheme covering its employees. This paragraph also deals with the need for a medical examination of the Employee as well as vaccinations etc. As with a domestic contract, a sickness clause requiring medical certificates and dealing with the period in which salary will continue to be payable is covered here. This may or may not be applicable. The letter contains a fairly standard provision which requires the employee to keep information confidential and to hand over all papers on termination. This provision is more widely drafted than would generally be found in a domestic appointment – in an expatriate post, the off-duty behaviour of an employee is more likely to cause embarrassment and to justify termination than at home. This clause is designed to protect the employer from an employee going to work for a competitor or even setting up on his/her own in the territory. Legal advice on the extent to which a restriction is enforceable is recommended. A standard clause dealing with the way in which a notice under the letter can be given. This letter assumes that English law will govern. The potential impact of local law should be checked by the employer and the employee. In this connection, it is not unusual for local law to contain, for example, a gratuity entitlement if the employment contract is terminated after an employee has served a particular period. Although that may not be reflected in an English law contract, an employee may be entitled to claim a gratuity under the local law. We suggest that specialist advice be obtained on the impact of the laws of the territory where the employee will be working.